NARGIS, the daughter of Jaddanbai and Mohan Babu, was born on June 1, 1929, as Fatima A. Rashid. She was introduced to films as Baby Rani in Talash-E-Haq. Nargis was not trained in any film institute. It was in the school of life that she learnt to observe human beings, their follies, foibles, strengths and weaknesses. At the age of 14, Nargis worked in Mehboob Khan’s Taqdeer opposite Motilal. Taqdeer heralded the arrival of an actress of immense merit. In Mehboob Khan’s Himayun, where Nargis played a commoner, Hamida Bano, with whom Himayun (Ashok Kumar) fell in love, the actress gave an exquisite performance. With her spontaneity and ease in front of the camera, Nargis set standards of competence. In Mehboob Khan’s Andaaz Nargis broke the prevailing norms and played the modern miss to perfection. The mirror scene where she questioned the ambivalence of her own feelings was the hallmark of her histrionic ability. After Andaaz Nargis became an integral part of Raj Kapoor’s cinematic ventures, playing all kinds of characters, whether it was the devoted beloved in Aag, Barsaat and Aah, a defending lawyer in Awaara, his conscience in Shri 420 and Jagte Raho. The Raj Kapoor - Nargis pairing in some 16 films made them the most adored cinema ‘couple’ of their time. They gave romance a new dimension. Nargis endeared herself to the masses with her trademark mannerisms; the knuckle of her forefinger in her slightly open mouth or the tossing back of her hair when it fell across the brow into her languid eyes. Her verve, vigour and versatility earned her the reputation of being a sensitive artiste. She lent emotional colour to black and white movies like Babul, Ashiana, Jan Pehchan, Sheesha, Anokha Pyar, Meena Bazar etc. In Anhonee, she used contrasting histrionics and body language to portray the disparity between twin sisters who were poles apart, socially and emotionally. In Deedar and Bewaffa, Nargis stood shoulder to shoulder with titans like Dilip Kumar, Ashok Kumar and Raj Kapoor, confidence writ large on her face. Once before the camera, Nargis merged into the character she played. She was the woman who cocked a snook at disapproving eyes as the swimsuit - clad heroine of Awara, found pleasure in the company of two men in Andaaz and drew approbation for her role of Surabha, a mendicant, in Kidar Sharma’s Jogan. At a time when stylised and affected acting was the norm, Nargis as Nirmala in Adalat was natural and spontaneous. In her films Nargis projected the image of a woman who could be desired as well as deified. As Radha in Mehboob Khan’s Mother India, Nargis imbued divinity to motherhood/womanhood. 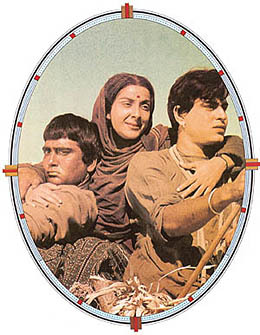 In the climax scene when Radha guns down her fugitive son Birju (Sunil Dutt), the feelings of seething anguish and tearing rage on her face are to be seen to be believed. Mother India remains a crowning glory for Nargis as an actress. The image of Nargis balancing a plough on her fragile shoulders simply refuses to fade away from the memory of the cinegoers. Mother India was also significant for Nargis personally. Though the popular belief is that Sunil Dutt married her after he saved Nargis from the blazing fire on the sets of the film, the reason is different. During the making of Mother India, Sunil’s sister was detected with tubercular gland. While Sunil was busy shooting the film, Nargis got her operated upon. That was when he proposed to her. On March 11, 1958, they got married. Nargis preferred roles/films in which she was not obliged to follow the beaten track. After nine years of marriage, Nargis returned to films with Satyan Bose’s Raat Aur Din. Maturity only made her beauty more fascinating. She was now a lived - in face, not just a mannequin. With her National Award-winning performance of a split personality in this film, Nargis bid adieu to showbiz. Years later, Nargis underwent treatment for the cancer of the pancreas at Solane Kettering Hospital in New York (USA). When her condition deteriorated upon her return to India, she was admitted to Breach Candy Hospital in Bombay. She sank into a coma on May 2, 1981 and breathed her last on Sunday, May 3, 1981. Her absence at the premiere of her son’s (Sanjay Dutt) debut film Rocky on May 7, 1981, where one seat was kept vacant for her, was an unforgettable event. Strangely, her presence was felt even more in her absence.